To understand how a San Diego divorce lawyer can help you, call today to schedule a free consultation! Roy M. Doppelt was just named a 2019 Super Lawyer! No more than 5% of lawyers in San Diego are named Super Lawyers, and the selection process includes a thorough evaluation and multiple criteria. 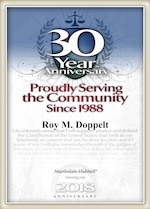 Roy graduated law school in 1987 and began practicing law in 1988. For over 30 years now, Roy has been assisting his local community with family law issues, including divorce, legal separation and paternity cases. While he has served hundreds of clients over his 30 year career, he still treats every single new and past client with courtesy, respect, and always takes the time to listen to client concerns and understand their goals. It is no surprise that he currently has 4.9 stars on Google! Roy has remained at the same office in Rancho Bernardo for over 20 years. He has worked with several associates, paralegals, staff and interns who have all had the privilege of benefiting from his knowledge. He has helped so many people through the most difficult time in their life by providing significant family law experience and a focused, objective perspective during an emotional time for clients. He is well regarded by his peers, opposing counsel, past and present clients, and Judges. It is no surprise to the people that work with him that he received this honor. Congrats to Roy M Doppelt for being named a 2019 San Diego Super Lawyer! Do you need assistance with your divorce, legal separation, child custody or child support case in San Diego? Call The Law Office of Doppelt and Forney, APLC for a free consultation at 800-769-4748. We proudly serve clients in San Diego and surrounding communities, including Chula Vista, Coronado, Carlsbad, Encinitas, La Jolla, Oceanside, Ramona, San Marcos, and Vista. We represent clients in family law court in all of the court houses in San Diego County including downtown, Vista, Chula Vista and El Cajon.